Many positive impressions but unfortunately a DNF result: That’s the report from Armin Schwarz and All German Motorsports at the San Felipe 250, the second round of the 2012 US SCORE Championship. On the ca. 250 mile route around San Felipe, contestants tackled several canyons between the Gulf of Mexico coast and the back-country. Typical for this race is that the 100 miles over washboard bumps pose a real test for man and machine. 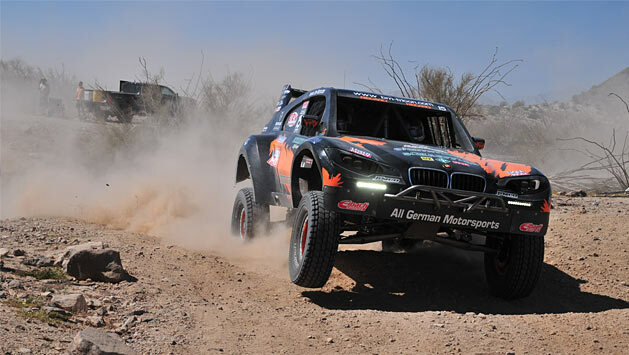 All German Motorsports had prepared the AGM-Jimco X6 SCORE Trophy Truck for this challenge. 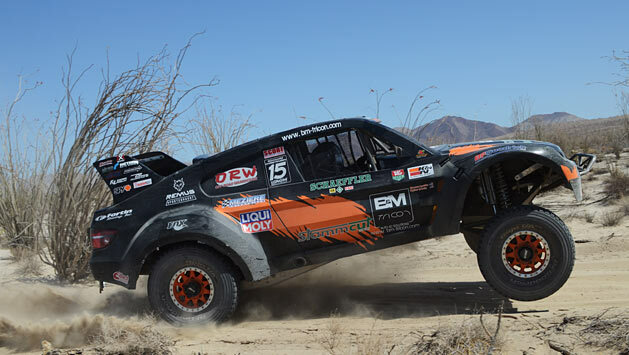 After the team found that they needed even longer springs at the season-opening Laughlin Desert Challenge in January, their partner Eibach produced them. With partner FOX, the shocks absorbers had to be adjusted to fit the new springs, and partner Danzio retuned the engine. These preparations were successful: “I was really satisfied because the truck was very fast. As far as performance was concerned it’s very good. Especially on the very, very bumpy and hard passages, the truck did everything we wanted,” concludes Schwarz. Initially the race was going just as well, although the ride over the washboards posed some minor difficulties. 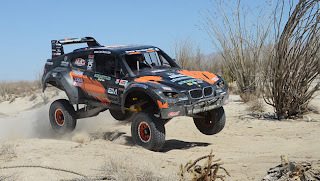 A glance at the interim standings shows just how fast the Trophy Truck was: After around 70 miles, Schwarz was running in third place overall. But then a bracket that holds the tank on the frame broke. “We had to weld that back on and that cost us about 20 minutes,” reports Schwarz. “Our pit crew did this excellently and we could continue. But then we lost some fuel as a result because the fast filling device leaked.” For this reason, the Trophy Truck stopped for a short while due to low fuel. The desert monster was refilled and the chase could continue. But the final chop came at mile 158. Ten miles before handing the Trophy Truck over to his colleague and team boss Martin Christensen, Schwarz’s charge was halted by a transmission problem. All the gears could still work but the drive was lacking. The cause is not yet clear but it will be analysed over the next days. During the tests in the lead up to the San Felipe 250 work focussed on the set-up, so as to match the pace of the much heavier competition. Now the focus is on durability and this is what the AGM team are keen to quickly come to grips with. Whilst the Trophy Truck was out before the finish, Armin Kremer and Tony Miglini put in a strong performance in the Class One Buggy fielded by All German Motorsports. Sharing the cockpit together for the first time, the pair brought home a decent fifth place in their class at the San Felipe 250. 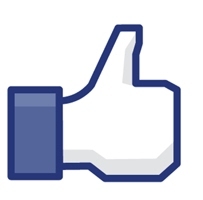 “That’s a great result. At least an All German Motorsports vehicle saw the finish line and with a great result at that – that’s really good,” said Schwarz. Now preparations begin at All German Motorsports for round three of the US SCORE Championship. From the 1st to 3rd June, the Baja 500 takes place with the start and finish in Mexico’s Ensenada. 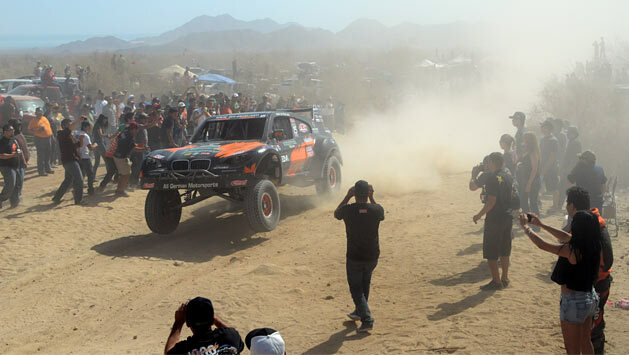 This event, is regarded as the ‘little sister’ to the notorious Baja 1000 that concludes the season from 14-17 November.